Keep your eyes on the pies! 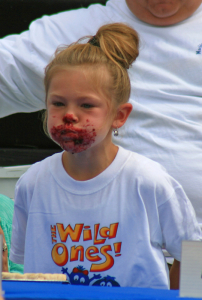 The Blueberry Pie-Eating Contest is fun to try, and really fun to watch. Contestants are chosen by lottery at 10 A.M. Ten registrants compete in four age groups: 7-10-year-olds, 11-14-year-olds, 15-18-year-olds, and adults. 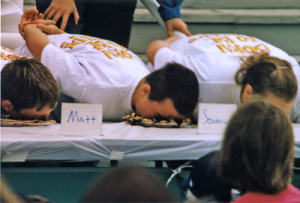 The Pie-Eating Contest begins at 11 A.M.
Rules are available at registration. Each contestant receives a T-shirt to wear during the contest, and a clean one to take home. Certificates are awarded. Of course, the greatest prize is the bragging rights!